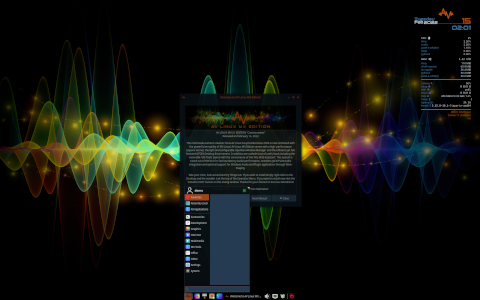 Rate this project AV Linux is a versatile, Debian-based distribution featuring a large collection of audio and video production software. The distribution's latest update is AV Linux 2019.4.10 which introduces a number of fixes and represents the project's last version to run on 32-bit hardware. "This release is basically an update of the ISO that fixes a couple of annoying bugs from the 2018.6.25 release with some notable updates and additions. It will mark the last release based on Debian Stretch and sadly it will also be the last release of the 32-bit version. Future AVL development will focus on Debian 'Buster' and 64-bit only. In the meantime I think this 2019.4.10 version will provide a fast, stable well prepared platform for AV Content creation for quite some time. Changelog: Refreshed expired repository keys for WineHQ and Spotify. Updated and fixed repositories for new Cinelerra-GG site. Updated and synced all Debian and third-party repos (including KXStudio). Fixed VirtualBox Guest Additions removal script to allow /etc/rc.local to remain executable and enable automount of external drives. Fixed missing 'linvstconverttree' in LinVST. Removed some obsoleted udev rules." Further details can be found in the project's release announcement. Download: isotester-avl64-2019.4.10.iso (3,662MB, SHA256, pkglist).